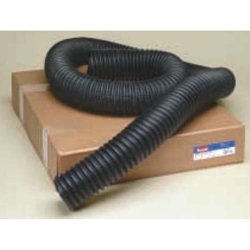 Flexible Garage Exhaust Hose 11' x 2 1/2" dia BOWES HO EH25100. Patented molded construction assures free flow of exhaust fumes and full comformance to OSHA standards when installed as directed. Designed to withstand the rigors of automotive shop service. The convoluted construction maintains 250% elongation and 1750 lbs. tensile strength even after crushing by a vehicle. Maintains flexibility and durability while withstanding exhaust pipe and gas temperatures up to 600 degrees F. Hose sections may be quickly and effectively joined by threading the flared end of one section with the non-flared section of another. Connectors and adapters are also available for a complete shop installation.